People sometimes describe me as a warrior poet, since I both engage in battle and chronicle my adventures for posterity's sake. This blog already has a fat "Tears" file thanks to all of the miner complaints. If you think about it, it makes sense to keep a record. Why? 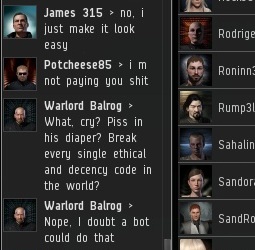 Because in the future, when the New Order encompasses all of highsec and all miners belong to us, there won't be any miner tears. Miners will only experience joy. Think about that. 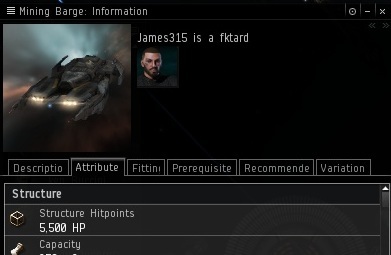 Hey, they don't call me the Saviour of Highsec just because it rolls off the tongue so easily. Sometimes the miners make memorable comments that aren't sufficient for an entire blog post. When that happens, they go into the Highsec Miner Grab Bag. Every so often, I will reach into the Grab Bag and toss out a collection of them for your entertainment. Enjoy. They'll never admit it, but the miners do take an interest in what I write. The manifestos referenced by Ms. Economics in the following quote are available in the Links section of the website. This next quote comes from a miner who occasionally does some kind of "status update" for the miners of Kino. It's kind of poetic, actually. When I began bumping, it was just lil' ol' me. As others joined the cause, the miners had to shift from the "lone nut" theory to the "lone nut with alts" theory. When that failed, they had to figure out how I was recruiting people. 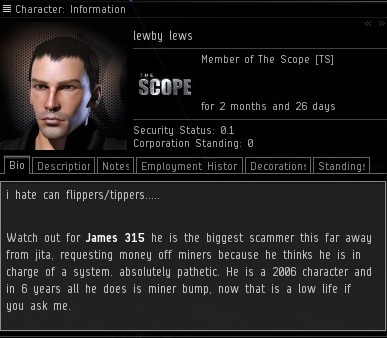 Because I accuse so many people of botting or bot-aspirant behavior, sometimes miners accuse me of being a sort of "bumping bot". I tell them that all of IBM's engineers combined couldn't create a bot that does what I do. Next up is a criticism of how I exercise my authority. To answer his question, "Zero thousand today." 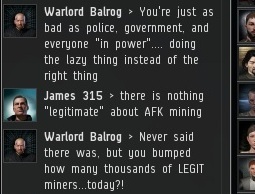 Some miners can rant for hours about the injustice of being bumped. Others, like the miner who sent me this EVEmail, get right to the point. Naming one's ship is an opportunity to express something about one's identity. For example, I fly a Stabber Fleet Issue and I can never be defeated, so my ship is called the "Invincible Stabber". Some miners, sadly, base their entire identity around their opposition to the New Order. I've just met him, but I feel like I already know so much about him, don't you? Still going on about this senseless babbling? 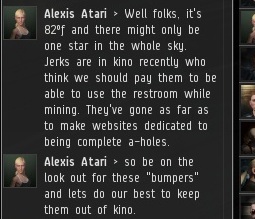 I'd honestly rather go mine in Goonswarm-territory than pay the 10million ISK you charge. At least Goon-space has good ore. I would rather reform and renew highsec. 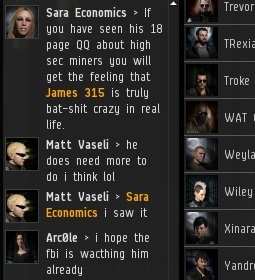 I mean it's not like every miner has the option of going off to nullsec to get blown up by Goons every day.